There are many types of pet reptiles to choose from. You may hear that people who care for reptiles and amphibians are known as herpetologists or herps. If you are just starting out, then choose one of the reptiles listed below that are easy to care for. Other reptiles are best left to intermediate caretakers. All of the recommended reptiles listed below do well in captivity. Pet reptiles are either caught in the wild or purchased from a breeder. Both types are found in pet stores. In general, it is better to raise a reptile born into captivity. These tend to be less stressed and used to being caged. It is also easier to breed a reptile that was born in captivity. They are also likely to be healthier with a lower incidence of parasites. Capturing a wild reptile can be illegal depending on where you live and the species. Taking any animal out of the wild is subject to debate since it disturbs the local ecosystem. Reptile Dealers: There are distributors that specialize in supplying stores and individuals with reptiles. There are also classifieds in the magazine listed above. Note that if you order reptiles online, that shipping can harm the animal. Avoid ordering reptiles in the peak of the summer heat or height of winter cold. There are also premium shipping services that will pick-up your order from the airport. 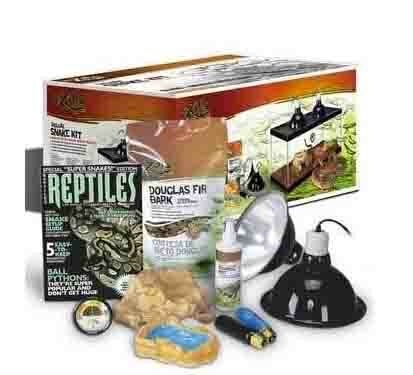 Check with the reptile dealer regarding shipping methods and policy. For example, if the reptile arrives at your home in poor health or the reptile is dead, what is the policy. A reputable dealer will guarantee the quality of pets shipped. Temperature: Reptiles are ecotherms, which means that they cannot regulate their own body temperature. Because of this they rely on the outside environment having the various temperatures needed. During the day this includes an area to bask or warm up under a heat lamp, a slightly cooler daytime area, and then a night time temperature for the entire environment. Reptile Diet or Food: Reptiles vary based on their choice of diet. Most reptiles bred in captivity will eat a combination of foods. There are also commercial diets available for more popular species. Omnivores: Meat and Plant eaters. Snakes: Skin should be completely shed around the eyes to avoid infections. Inspect belly for burns which come from exposure to hot rocks in a reptile terrarium. As mentioned, your choice of a pet reptile changes if you are a beginner, intermediate or advanced herp. This list from PetSmart represents different reptiles classified by the difficulty of care. Click on the links to learn more about each type of pet reptile. The following represents reptiles that you might want to avoid since they do not do well in captivity. Burmese Pythons: Also large, at 20 ft. This snake is a constrictor. Red-eared Slider: Turtle that is 8+ inches long. Not recommended due to salmonella risk in turtles greater than 4 inches in length. Requires a large reptile terrarium that includes a swimming area and area for basking in the heat. African Spurred Tortoise: Adults grow to 60 to 120 pounds. Horned Lizards: Harvester ants are part of the diet. Senegal Chameleons: Senegal chameleons are oten caught in the wild. They do not adapt well to captivity. The chameleon also is known to have an above average incidence of parasites. Green Iguana: Grow to 6 feet. Seasonal breeding results in male Green Iguanas becoming difficult to handle, including biting and scratching. Have a Reptile Question for our Vet? We Will Answer it for Free! Do you need some reptile care or selection advice? Just ask a question and our Vet will answer it as soon as possible. If your question is medical or behavior related, please include information such as species, age, diet, habitat and anything related to the medical history of your reptile. Please upload a picture of your reptile, especially if you believe it will help the Veterinarian. Please know that we receive many questions and answer them on a first come, first served basis. If you need an immediate response, we suggest you use this online veterinary service that is available now to answer your questions.